“Totally unknown,” says Kitahara. That is clearly an exaggeration, for in support of his thesis he cites numerous written sources, official and scholarly, contemporary and modern, which others beside himself must have read. But this much at least is true: You can read a lot of Japanese history without ever coming across mention of a systematic international trade in Japanese slaves. Why should this be? Assuming it is a fact, it is shocking, illuminating and, Kitahara argues, enormously consequential. Nor — unlike, say, Japanese wartime atrocities — would it be in anyone’s interest to cover it up. Why isn’t it common knowledge? Japan first met Europe in 1543, when a storm blew a Chinese ship with Portuguese traders on board to the outlying island of Tanegashima, in Kagoshima Prefecture. Two revolutionary novelties accruing to Japan from that chance encounter are well known — firearms and Christianity. A third, says Kitahara, was the slave trade. Before long Japanese slaves were being bought and sold not only throughout Asia but as far afield as Portugal and Argentina. 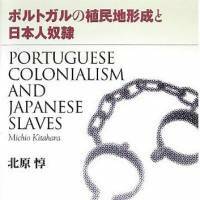 Some slaves were captives in Japan’s eternal civil wars, sold by their Japanese captors to Portuguese traders. Others sold themselves or their children into slavery to escape crushing poverty. Still others were sold by feudal lords to finance a new craving — for gunpowder. Portuguese authorities — royal, bureaucratic and religious — were uncomfortable with this traffic. It brought Portugal and Christianity into low repute, damping the potential for trade and religious conversion. There were fitful efforts to stop it. But Portuguese merchants carried the day with a protest: “We have spent one million cruzeiros or more over the years to purchase slaves … Therefore, we cannot accept that the King revokes this right and deprives us of the slaves we have already purchased.” The king yielded. The aftermath is well known, though slavery is rarely cited among the causes: foreigners were expelled, Christianity was ferociously uprooted and Japan, in self-imposed, rigidly enforced isolation for 250 years, embarked on a course of cultural and political development quite unique in the annals of world history.